The Imperial Palace is the residence of the Emperor and Empress of Japan. Inside you will find the East Gardens (closed Mon & Fri every week and 12/28-1/3 every year) which are the former site of Edo Castle’s innermost circles of defense. Guided tours are available with advanced booking. The moat surrounding the palace is a popular jogging course. 10-15 min. from Nijubashimae Sta. 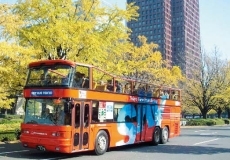 An “open deck” bus that takes you around the Marunouchi area without getting off from the bus. It runs every hour, starting at 10am. Board at the Mitsubishi Building and it will take you past Ginza, the Imperial Palace, the Diet Building and many more spots during the 50-minute-tour. 3 min. from Tokyo Sta. A guided cycling tour takes you to major tourist spots around Tokyo. The fee includes rental bike and lunch. Check the website for details.